Handler 210MVP uses household current or 230VAC for flexible wire welding. Hobart has introduced the Handler 210MVP, a multi-voltage wire welder that uses 115 VAC or 230 VAC with the twist of a control—and no tools required. The 210MVP automatically adjusts itself to the correct input voltage for superior arc performance and has the capacity to weld 3/8-inch thick mild steel, as well as the precise control (infinite wire speed and 7 voltage taps) for welding 24 ga. sheet metal. The machine also features an integrated spool gun control circuit that allows the direct plug-in of a spool gun (sold separately), along with a selector switch that permits a quick changeover between the MIG gun and the spool gun. 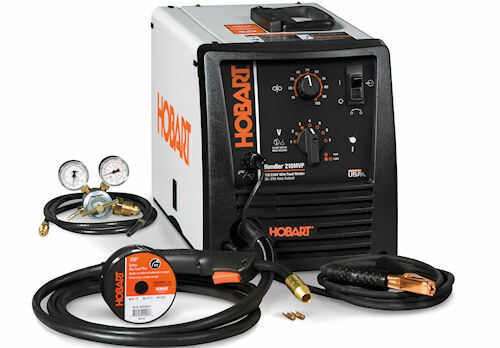 The new Hobart Handler 210MVP wire welder uses 115VAC or 230VAC with a no-tools "simple twist" control. The 210MVP comes with a 10-foot MIG gun and 10-foot work cable with clamp. It also comes with a sample spool of .030-inch self-shielding flux-cored wire; .030 inch contact tips; a spool hub assembly that handles 4- or 8-inch spools; and dual-groove quick-change drive rolls that makes switching wire diameters an easy task. For more information, visit www.hobartwelders.com, or call (800) 626-9420.